Social media moves at a lightening pace. It seems likes as soon as you start to get the hang of one network, three more new networks popup. Sometimes it can seem impossible to stay up to date with everything that is going on. So, what should you do? One thing we have found extremely helpful is following some of the best social media marketers in the business on Twitter. Each of these social media experts has a different area of expertise and strategy, but learning from them daily can greatly improve the effectiveness of your social media marketing efforts and make keeping up with the changing trends more manageable. Do not try to fight the social media battle alone! 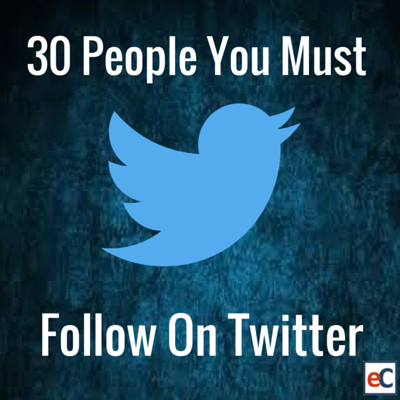 These individuals are extremely successful for a reason, so shoot them a follow request and let the learning begin. 1. Kim Garst (@kimgarst): Social Selling Pro, Twitter Expert, Best Selling Author, Speaker, @Forbes Top 10 Social Media Influencer, @EntMagazine columnist. Loves God, family & hockey! 16. Guy Kawasaki (@GuyKawasaki): Mantra: I empower people. Chief evangelist of Canva. canva.com/ . Author of thirteen books. Former chief evangelist of Apple. 21. Chris Voss (@CHRISVOSS): Social Media Consultant, Trainer, Speaker, Photographer, Travel Blogger, CEO. Top SM Leader seen by Forbes, CNN, Huff Po, Alltop News & other media etc. 25. Jayson DeMers (@jaysondemers): Founder & CEO of AudienceBloom (audiencebloom.com ), a Seattle-based content marketing & social marketing agency, writer for Forbes, HuffPo, and more. 28. John Jantsch (@ducttape): Small business marketing consultant, speaker and author of Duct Tape Marketing, Duct Tape Selling, The Referral Engine and The Commitment Engine. Looking for even more experts to connect with? Subscribe to our Social Media Superstars List to learn from the individuals mentioned in this post and hundreds more!